Brent oil prices fell by 2.80% (US$1.61), as prices declined this week. Oil traded on October 4, 2017 at a price of 55.80 (US$/ barrel) and began the year at US$56.90 per barrel. 87 Octane prices declined week over week, by 0.40% (US$0.47 ). Additionally 90 Octane declined by 0.39% or $0.47 week over week. 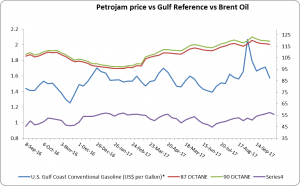 87 Octane and 90 Octane opened the year at J$97.32 and J$98.98 respectively and now trades at J$116.81 and J$119.65 per litre . The first week of October marks the start of the winter heating season. Propane inventories in the Midwest, Petroleum Administration for Defense District (PADD) 2, have increased in the past few weeks to reach levels near the five-year average (normal). However, the process and timing of inventories reaching their normal levels this year was unusual, likely because of disruptions on the Gulf Coast related to Hurricane Harvey. Midwest propane inventories at the beginning of the heating season are an important indicator of supply adequacy. Currently the National Oceanic and Atmospheric Administration (NOAA) forecasts winter weather in the Midwest to be 15% colder than last year, but in line with the five-year average. In the event of an unexpectedly colder-than-normal winter, inventories are needed to manage properly rapid changes in short-term demand, such as those that occurred during the winter of 2013-14. Heading into the winter of 2013-14, Midwest propane inventories were 2.5 million barrels lower than was typical for that time of year based on a historical five-year average. After elevated agricultural demand for corn grain drying was followed by colder-than-normal weather, Midwest propane wholesale prices were nearly $5 per gallon (gal), compared with prices of less than $1/gal recently this year. Midwest propane inventories are highly seasonal and typically build from April through September to prepare for higher demand in the winter. Although the pattern of propane inventory builds varies from season to season, inventories are typically between 25 and 28 million barrels by the start of October (Figure 1). Inventories this year have grown by 10.9 million barrels from the start of June to 26.4 million barrels for the week ending September 29, 2017, 3.6% lower than the previous 5-year average.